Democratic congressional members, emboldened by a freshman class that put their party in control of the U.S. House of Representatives, have pressed fast-forward on introducing progressive legislation. The Green New Deal is one example. Legalization of recreational marijuana from sea to shining sea is another. New Jersey Sen. Cory Booker has reintroduced the Marijuana Justice Act, which he first proposed in 2017. It legalizes marijuana at the federal level, among many other sweeping changes. The chances of it passing Congress and becoming law are approximately zero — Republicans still hold a majority in the U.S. Senate and President Trump has a veto — but it should at least get a full hearing in the Democratic-controlled House. California Representatives Barbara Lee and Ro Khanna have introduced the act in the House. Support for the Marijuana Justice Act. 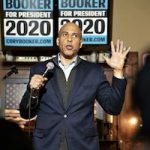 Booker’s reintroduction of the Marijuana Justice Act has led to a remarkable moment in American history: a handful of presidential candidates have joined Booker in supporting national legalization of marijuana and signed on as co-sponsors of the bill. They include the following senators: Kirsten Gillibrand of New York, Bernie Sanders of Vermont, Kamala Harris of California and Elizabeth Warren of Massachusetts, (D-MA). The only senator running for the nomination who hasn’t sponsored the bill is Amy Klobuchar of Minnesota. That’s remarkable considering just five years ago, only Colorado and Washington had legal recreational marijuana sales and no presidential candidates supported legalization nationwide. What does the Marijuana Justice Act do? Removes marijuana from Schedule 1 of the Controlled Substances Act, where it’s been listed since the early 1970s, along with heroin and cocaine. States determined by the U.S. Attorney General to have a “disproportionate arrest rate or a disproportionate incarceration rate for marijuana” will face elimination of funds for the building of prisons or jails and a 10 percent reduction in other crime-related federal funding. Those withheld funds would be used to establish a $500 million Community Reinvestment Fund administered by the Department of Housing and Urban Development to award grants to communities hurt most by the War on Drugs. Grants could fund job training, public libraries, community centers, youth programs and health education.